I am Ren Fengmin, 50-year-old, a native of Chengguan Town, Fang County, Shiyan City. I am living in an apartment building built by the grain administration in Fang County. I had lived in the Second Group, Hualong Village, Longyan Town, Fang County with my parents and younger sister before I got married. My father was a skillful farmer, and my mother was a diligent and kind woman. Both of them loved my younger sister and me very much. 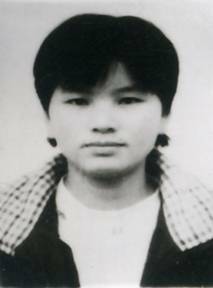 My younger sister Ren Jinhuan was well-behaved, often helping my father with farming work though she was the youngest child in our family. We lived a happy life together. In summer 1992, my younger sister graduated from high school. She was admitted by a university, but we were too poor to afford the tuition. So then-20-year-old Jinhuan chose to go down south to earn her tuition. She found a job at a toy factory in Shenzhen. Being a hard-working and responsible person, she was soon appointed as the head of a working group. When she was paid for the first time, she bought sweaters for my parents. My mother was so excited that she often said she was proud of her daughter. In early 1998, my sister seemed somewhat weird. Initially, she made a phone call to us every week. But during the following months, she did not call us. My mother guessed that she was busy with work. As time passed by, my mother got increasingly worried. Then she called Jinhuan’s roommate and friend, from whom she learned that Jinhuan was practicing Falun Gong. At that time, we knew nothing about Falun Gong. So we just persuaded my sister to concentrate attention on her work. Maybe all young people like to learn the things new to them. My sister got obsessed with Falun Gong. At first, she just read the book Zhuan Falun, and sat in meditation at some times. But step by step, my sister began to worship the book. Sometimes she told us via telephone that her master was the Śākyamuni Buddha reincarnated who was able to lead ordinary people to ascend spiritually and eventually become immortal. She bought many books and cassette tapes on Falun Gong. In July 1999, when we learned from leaders of our village that Falun Gong was outlawed by the government, we immediately called my sister, persuading her to give it up. But she requested us not to bother her. She added that she had ascended to a high level with the help of her master, getting closer to the goal of consummation. On October 26, 1999, my sister quitted her job and went to Beijing with other practitioners without telling us. Afterwards, she came back home because she lost her job and spent most of her money. Since she came back home, she had been obsessed with her master and Falun Gong, while neglecting her family members. She began sitting in meditation at 9:00 in every morning. She told us that it was her way to communicate with her master and to learn from him. She not only read the book Zhuan Falun, but also copied it for several times in a day. But it never crossed my mind that my sister may lose her life to achieve the so-called consummation. On April 20, 2000, a few days after my sister’s 28th birthday, she privately left for Beijing to defend Falun Gong with her fellow practitioners when my parents and I were busy with the farming work. It was April 26, the day I will never forget. On the bus heading toward Beijing (on a road in Fengtai District), my sister suddenly became hysteric. Out of illusion, she fixedly gazed at the sky and waved her arms fiercely. Then she jumped out of the bus, shouting “Falun Dafa is great”. She was thrown to the ground about ten meters away from the bus and died tragically on the spot. We could not believe it when we heard the death of my younger sister. When my father brought back the ashes of my sister, my mother cried and fainted. My younger sister can never come back. To achieve her goal of consummation, my sister died at the age of 28.